It’s your friendly alumni team here. Yes, we know – you haven’t graduated yet and you’re probably wondering why we’re getting in touch, but it suddenly occurred to us that you might know absolutely nothing about us. And frankly, we want to change that. Did you know we have over 170,000 alumni in 190 countries across the world? No? Okay, well that’s just for starters! 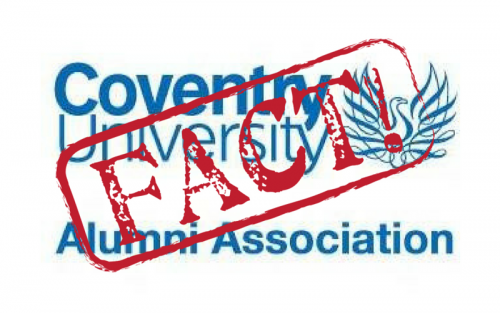 When you graduate from Coventry University you automatically become a member of the outstanding network that is Coventry University Alumni Association. While you’re at Coventry University did you know you can attend guest lectures from people like you, who have already gone on to achieve great things? But as we all know, with a great job (disclaimer – we know it’s ‘power’) comes great responsibility! That means when you graduate and start smashing it in the real world, we want you to come back here and tell students what you’ve achieved. It’s a whole pay it forward thing. We also have a whole host of mentors just waiting to help you out and discuss what you should be aiming for and how you can achieve it. A great way to get to know us is to sign up and become a student ambassador. You’ll get to do some great things like help out at alumni events on campus, get involved with graduations, give visiting alumni tours of the campus, and not forgetting THE fashion accessory of 2018 – you get to wear a sash that says ‘student ambassador’! That is a pretty great opportunity to bend the ear of someone who might just be doing the dream job you want. It’s not all now, now, now though. We are here for life. That’s right. You graduate from Coventry and we’ve got your back whatever you go on to do… within reason! The mentoring continues long after you graduate, with ‘alumni to alumni mentoring’. As well as re-connecting with old classmates, you can also speak to senior people working in the same field as you for advice and in turn, grow your professional network. We are keen to keep in touch with all our alumni wherever they are, which is why we hold a number of events throughout the year, both in the UK and internationally. These are not only great networking opportunities, but we also host guest speakers and provide amazing workshops – all designed to boost your skills. All our events will be posted on our soon to be launched website, this will also be the place to visit to find out how to get involved with our international alumni networks. Now, we don’t want to blow our own trumpets or anything, but we think this all sounds really good! 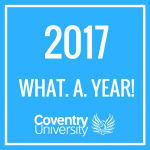 So, if you want to get in touch to find out more, drop us an email at alumni@coventry.ac.uk and keep a look out for an event near you soon. ALSO, please feel free to say hello to us on Facebook, Instagram and Twitter. Advice and Tips, Get Involved!, International, Join Us, Mature Students, Postgrad, Undergrad, Why Cov Uni?